HELLO I BOUGHT A KOBE JERSEY ON EBAY FROM THE SAME VENDOR THAT IS POSTED ON POST #13 DIFFERENT AUCTION #.THATS WHY I BOUGHT IT TO SHOW HOW EASY IT IS TO GET ONE ON EBAY.AND THERE ARE A FEW OF THEM OUT THERE.THAT IS WHY I STARTED MY THEAD KOBE JERSEYS.THE JERSEY IS BEING SOLD IN MY EBAY AUCTION FOR WHAT I PAID FOR IT $560 AS A TEAM ISSUED. Unused Dr. J. game shoes purchased by white-apple. 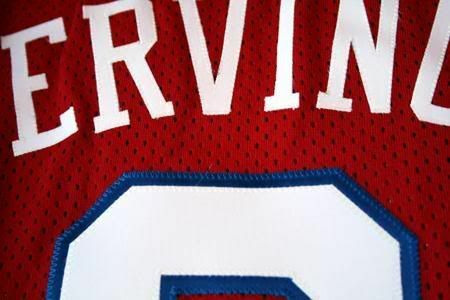 Nice vintage Julius Erving sand knit jersey. 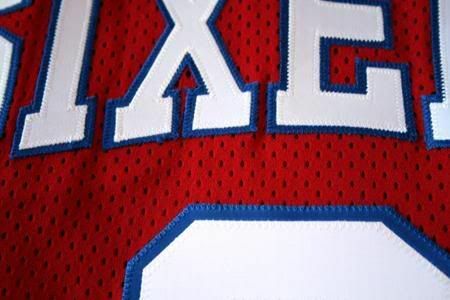 Did Sand Knit ever make the Sixers jerseys? It does have an exclusive tag. 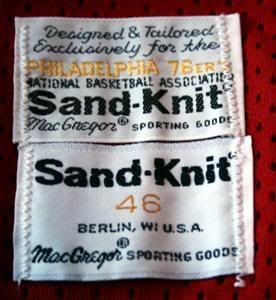 The 76ers switched to Sand-Knit for the 1986-87 season - Erving's last. 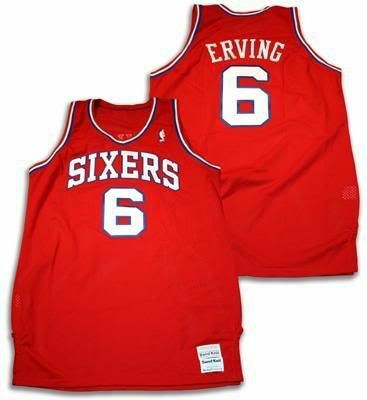 From 1976-77 thru 1985-86, Erving wore Wilson Sixers jerseys. I posted it on another thread...that guy had a number of Sand-Knit hoops jerseys. Some looked to be team issued and some were the retail authentics. Once again, I'm really glad that I stumbled upon this place as I in just a few weeks have learned mucho information and this thread is just another tool to work from when buying. As I've stated before, I collected GU items back in the late 80's and through the mid 90's and was able to source my stuff directly the Dodgers, Angels and a few other sources. I recently got back into it that last couple of years as I've been going to about 30 to 40 games a year and have rekindled the flame and have again found some sources to get the goods. Nevertheless, I have dipped into the ebay pool and each and every thing I have acquired via that media has been kosher/jake... but that's only because I only am collecting LA Dodgers Items and have a good basis of what is what with them. However, if I ever decide to step outside of that realm, I know that the knowledge I have gleaned here will save me from giving my $$$ away on fakes and misrepresented goods. The Wash Tag "Fake" Code is definitely a great tool to be armed with. However, on the down side, the scammers do read this stuff and will adjust their tools of the trade. This one I got before it got to be team issued. I got it at the Russell factory outlet the summer of 1984. It is consistent in every way with a Dolphins game jersey of that era. I am almost 100% positive that Russell's retail jerseys were not this length, and the tagging is consistent with other Dolphin jerseys I have seen (i.e. a letter size and not an number size). Marino did not wear jerseys with stretch side panels during 1984. Someone please correct me if I am wrong. I still remember the day I bought this. They had a whole rack of Dolphin jerseys and some 49er jerseys too.